All programs, products and services are owned and provided by Rebecca Ellison Creative, LLC (“Company” or “we” or “us” or “our”). The term “You” or “Your” refers to any user or purchaser of said program(s), product(s) or service(s) (the “Offering”). These Terms and Conditions of Use govern and define how You are allowed to use and access Company’s Offering. We reserve the right to update and change these Terms and Conditions of Use at any time, and will update them accordingly with the ‘date last updated’ at the top of this page. You are legally bound to these Terms and Conditions of Use whether or not you have read them. If You do not agree with any of our Terms and Conditions of Use, please email us at rebecca@rebeccaellison.com and we will make reasonable efforts to remove your name, email and access to our Offering and website(s). Conditions of Use as well as any disclaimers and privacy disclosures contained in these Terms and Conditions of Use. All images, text, designs, graphics, trademarks and service marks are owned by and property of Rebecca Ellison Creative, LLC, or the properly attributed party. It is a violation of federal law to use any of our intellectual property in whole or in part, and modification of any materials contained on this site is illegal and may be prosecuted to the fullest extent permissible should we choose to do so, including asking for financial penalties (damages) and/or an injunction forcing you to stop using our intellectual property immediately. Limited License. 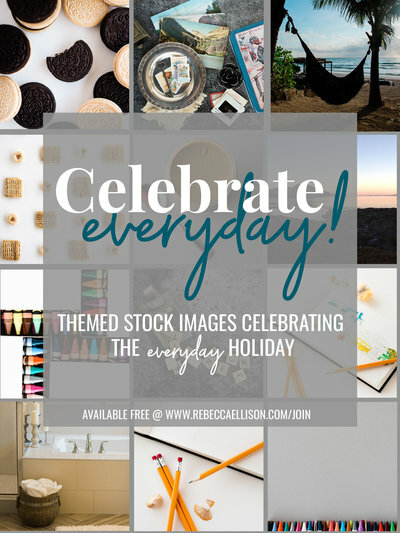 Any and all materials, paid or free, that You access on this or any related domains that contain our Offering are under the sole ownership or licensed use of Rebecca Ellison Creative, LLC. You are only receiving a limited, non-transferable, non-exclusive, revocable license for non- commercial use only in order to access any content or materials in the Offering you have paid for or opted to receive. If You exceed the scope of this license, as determined by a legal authority such as a court of law or the Trademark Trials and Appeals Board, you have committed infringement in a manner that materially harms us, and we have the right to seek damages and/or an injunction to remedy the situation until we are made whole. - Use our trademarks and copyrighted materials with our consent and proper credit and marking, namely, citing ©Rebecca Ellison Creative, LLC as the source of the materials and marking any federally registered trademarks with ® or common law trademarks with TM. Even though our Offering is not necessarily something you can physically hold in your hand and walk away with, it is nevertheless considered theft to steal, infringe or otherwise violate these Terms and Conditions of Use. We reserve the right to prosecute infringers to the fullest extent allowed by criminal or civil statute in any jurisdiction allowed. You explicitly consent to personal jurisdiction in Washington by opting into or purchasing any Offering or accessing its related communications and/or materials. accessing the Offering, or voluntarily upon Our request. Such a default or voluntary release of Your image and likeness may be used for any reasonable future business use. This website is updated on a regular basis and while we try to make accurate statements in a timely and effective manner, we cannot guarantee that all materials and related media contained herein are entirely accurate, complete or up to date. You expressly acknowledge and understand that any information or knowledge you gain as a result of using this website is used at your own risk. If you should see any errors or omissions and would like to let us know, please email us at rebecca@rebeccaellison.com. We make reasonable efforts to provide You with modern, reliable technology, software and platforms from which to access our Offering(s) and related material(s). However, in the event of a technological failure, You accept and acknowledge our lack of responsibility for said failure, and while we will make reasonable efforts to support you, some technological issues are far outside our control and will require you to access support from a third party provider. Due to the nature of the services and/or products provided, refunds will not be given unless otherwise specified in writing. Rebecca Ellison Creative, LLC reserves the right to charge 1.5% interest per day upon any outstanding sum left unpaid on or after 14 calendar days from due date. After 30 days of outstanding payment, Rebecca Ellison Creative, LLC reserves the right to send you to collections, upon which you will owe the total amount of any outstanding payments plus any collection costs including reasonable attorney’s fees. Within 30 days of Your initial purchase or payment of the Offering, We will refund you if you have accessed all the Offering materials, provided us with proof of completion and agree to a 30-60 minute phone call to discuss why the Offering was not a good fit for you. You have the unilateral right to terminate your use and access to any of Our Offering(s). Please send an email to rebecca@rebeccaellison.com to initiate this process. Termination will not excuse you of further payment. Upon confirmation of your termination, any and all outstanding balances will become immediately due and payable. Any existing balance that remains after 14 days from the date of termination will be sent to a collections agency, and You agree to be responsible for any additional charges, fees or costs associated with such a collection effort, including but not limited to reasonable attorney’s fees and court costs. Sale or Bankruptcy: In the event that our company is sold, goes out of business or enters bankruptcy, your information may be an asset that is transferred to a third party successor.